In a nutshell, this respectable LED television entry by TCL is well suited for young couples that desire quality viewing experience, but are on a limited budget. It is also well situated for any individual that needs a television for a spare bedroom or office, but does not want to shell out big dollars for that privilege. The television itself is rated as durable enough to support daily viewing and is adaptable to support gaming features as well. While the size may limit its use to smaller rooms and more intimate settings, this can be a great addition to a game room, or for late night movie watching. The TCL 32-inch model is slim and sleek, and it brings premium picture quality to any entertainment area within the house. Because of its slim nature, the television itself can fit almost anywhere, meaning that the superior picture quality can be viewed from anywhere within a small to medium size room. The picture itself is enhanced by a High Definition viewing experience that brings with it a respectable 720p resolution and a 3,500,000:1 dynamic contrast ratio. This ensures that the picture is not distorted as an individual moves closer and closer to the screen. To further enhance the image quality, this particular model is equipped with True Color Technology, resulting in a superior contract and brilliant array of colors that makes it more than suitable for both television viewing and gaming experiences. The feature rich TCL model also has direct LED backlighting, which enables individual to view black color in a darker perspective, while still being able to laminate bright colors as well. The main strength of this model lies in its price and its maneuverability. 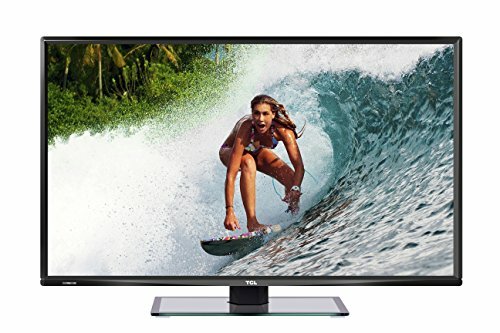 Priced most places under a few hundred dollars, this is a great television with many features that can likely fit within most budgets, particular for young people and individuals who simply need a spare television. Also, the television itself think and easy to move, which makes it suitable for a wide array of locations within a typical house or another type of building environment. The television is limited, however, in its sounds features and it does not provide many of the modern technological enhancements and plug and play ability available in many higher end models. If one does not require those abilities, however, this model is a great option. This model by TCL brings home a viewing experience that will wow many viewers with the color, clarity, and detail of the picture, particularly at this pricing point. In addition, the 32-inch model has a sleek design that adds a contemporary feel to any room, and it is equipped with an energy efficient LED console.